Our Army At War premiered in August of 1952 and lasted 302 issues until February 1977 when the title was changed to Sgt. Rock to reflect the popularity of its main character. Sgt. Rock would last until July 1988 with issue #422. Our Army At War is known for its main character, Sgt. Frank Rock of Easy Company. Although a character nicknamed “The Rock” debuted in GI Combat, Sgt. Rock as we know him debuted in this comic in 1959. He was created by Robert Kanigher. Easy Company was the unnumbered regiment he commanded. It saw action in every European theater. Easy contained African-American members – an anachronism for more enlightened times. Some members were given nicknames such as Bulldozer (the second-in-command), Wildman, Jackie Johnson, Little Sure Shot, Ice Cream Soldier and Four Eyes. 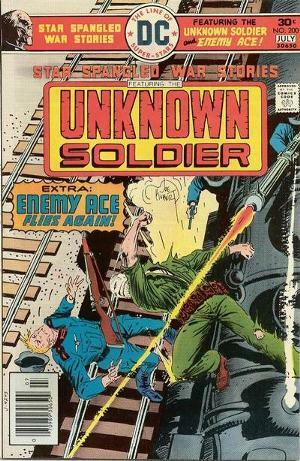 Our Army At War also earns its place in comic book history for the first appearance of Enemy Ace in #151 (February 1965) – the flying ace of WWI who proved very popular as an anti-hero. But by July 1976 the Enemy Ace feature was gone and Sgt. 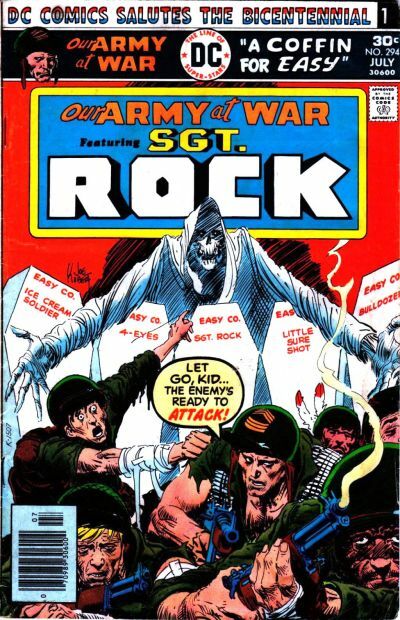 Rock and Easy Company dominated the comic. Easy Company runs out of ammunition and prepares to face a troop of Nazis with bayonets. Monks in a hearse drawn by two horses approach – it is Mlle. Marie and her brother Jules, who bring ammunition in the coffin! Mlle. Marie, Rock and Easy fight off the Nazis. Rock reveals their mission – find and destroy the secret oil pipeline in the village of Aix. This is the village in which Mlle. Marie’s brother Jules lives! Her brother is a … er … brother in Aix’s church. While searching the church, Rock finds the oil pipeline following an underground river. Jules rings the church bells to warn the villagers to evacuate before Easy detonates the explosions. The Nazis investigate and Jules is killed in the battle. Rock, Easy and Mlle. Marie make it to the hills as the pipeline explodes, collapsing the village in the river and killing off the Nazis stationed there. The church bells ring one last time as if to honor Jules’ sacrifice. Bob Kanigher’s Gallery of War: “A Pair of Boots”, Robert Kanigher ( w ), Ric Estrada (a). Near Warsaw, Pvt. Fritz Vorst Wermacht-is issued boots that are too painful for his feet. He stops to eat and shoos away two cardinals trying to eat his crumbs. He kills a Polish officer and steals his soft leather boots. He tries to assault a village girl and kills her when she tries to run away. He is killed hiding in a farmhouse during a mortar barrage. The two cardinals he shooed away nest in his empty boots (boots, shoos, get it?). Take Ten (Letter page): comments for OAAW #289. Walter Green of Wading River, NY (positive), Terry Chadwick of Phoenix, AZ (positive), Wade Sears of Calgary, Alberta (mostly positive, but critical of the lack of Commonwealth soldiers – UK, Canada, Australian, etc. and questioning the accuracy of Nazi tank tactics. ), James Parker of Clarksville, TN (negative – questioning the time setting of the story in #289 being only 8 months before the end of the war. The editor explains that the stories depicted are not chronological) and Robert LaChine of Chicago, IL (negative). E. Nelson Bridwell answered the letters. 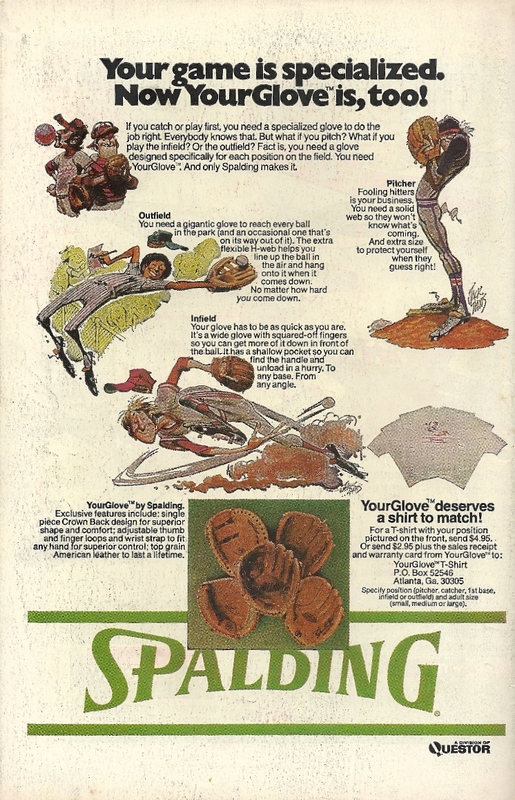 There have been ads in comic books as long as there have been comic books. Some of the ads have become part of our pop culture – more memorable than most of the comic book characters themselves. 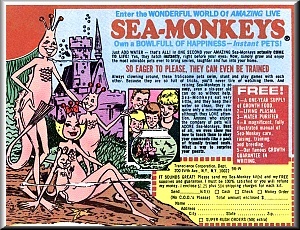 Sea Monkeys, anyone? 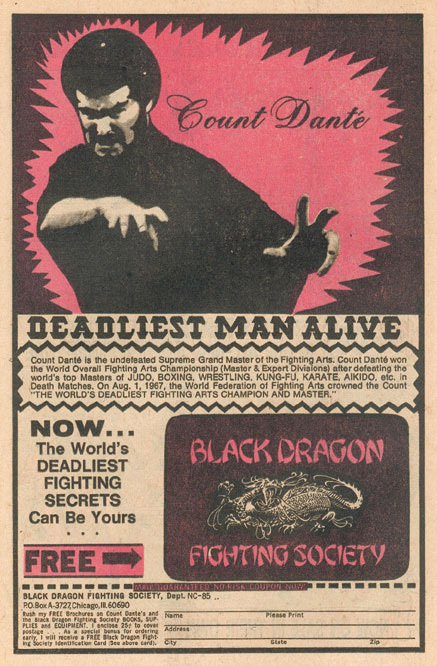 During my prime-time comic reading, I quaked in fear at the Deadliest Man Alive – Count Dante’! I wanted X-Ray Specs and to learn to throw my voice and go on the Tilt-A-Whirl at Palisades Park (free admission with my Superman coupon) and to win valuable prizes selling Christmas cards and what the hell is Grit? 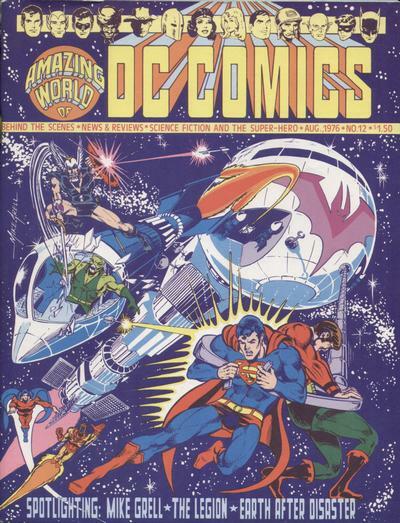 The 33 DC comics with the Bicentennial heading contained either 32 pages or 48 pages – not counting the covers (which would add four more pages). Counting those four, all the comics contained 17 pages of the same ads. They might not appear in the same places – an ad from page 12 of one comic would be on page 23 of another – and some reprint titles would have house ads at the bottom third of the page ending a chapter or a story. I will tell you about those variations when I talk about the specific issues. But otherwise the ads were all the same. The centerfold (the middle four pages) of the 32-page comics were all ads, which was traditional for DC at the time. I’ll use the first Bicentennial Comic – Our Army At War #294 as the template. Inside front cover: Hostess Cupcake ad: “Superman Saves the Earth” – there are websites dedicated to these classic Hostess ads. DC, Marvel, Harvey and Archie comics had dozens of them featuring every popular character you can think of – the Joker starred in three, Josie of “…and the Pussycats” fame? 19! This one is typical – aliens meet to discuss the fate of the earth. Because it is so primitive and backward, humanity must be destroyed! 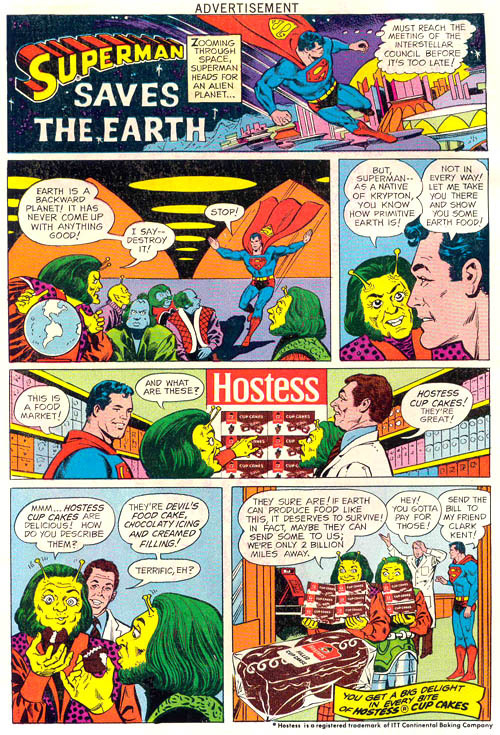 Superman takes the aliens to a grocery store and introduces them to Hostess Cupcakes. The aliens love the cupcakes and spare the earth (the aliens are obviously of great intellect – in this writer’s opinion the original Hostess Cupcakes are tangible proof of the existence of God…). A species that can create such spongy cake and creamy filling deserves a chance! Whew … good thing the aliens decided this in 1976 and not after Hostess went bankrupt … we’d be doomed! 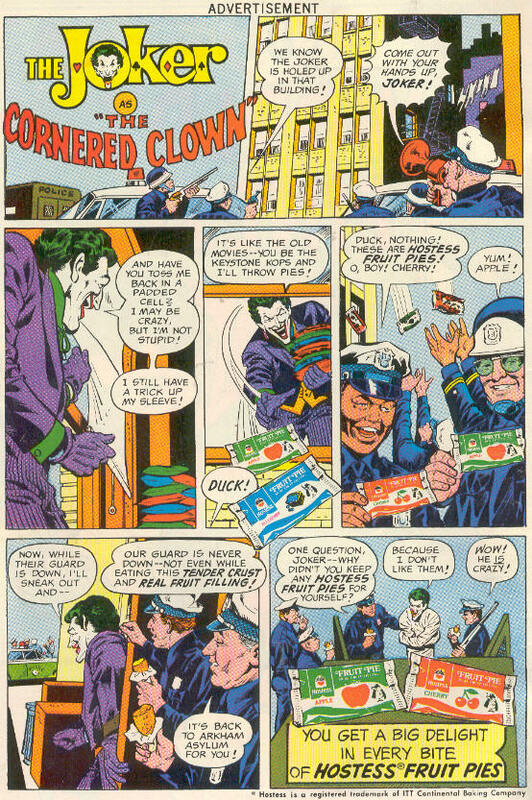 A few DC Comics exchange this Superman ad with one starring the Joker called “The Cornered Clown”. He is trapped in a building cordoned off by the police. He tosses them Hostess Fruit Pies to distract them as he escapes out the back. Despite such tasty treats, the police are not fooled and are waiting to arrest him. Now if he had only thrown glazed doughnuts he might have succeeded. I will let you know which comics feature the Superman ad and which feature the Joker ad. Page 5: a full-page ad for Charms Blow Pops. Page 6: two half-page ads for selling social security plates (checkbook-sized holders with your number and an American eagle emblazed above it) – this was before identity theft was prevalent, obviously; and an ad for Slim Jims. Page 11: a full-page ad for Grit. Grit is still around, you know. It’s not a newspaper anymore; it’s a glossy magazine, but still around. Did anyone out there sell Grit for big money and prizes? 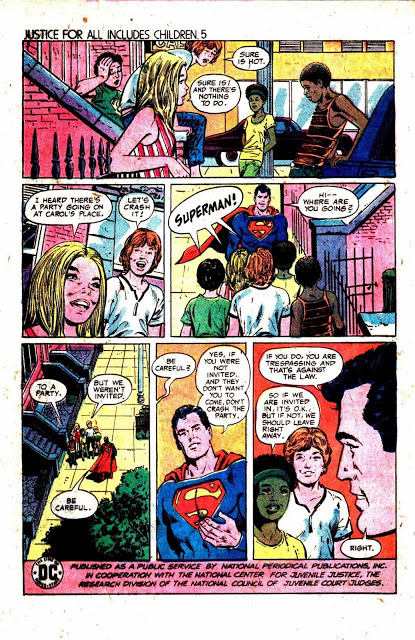 Page 12: a full-page DC house ad for its latest tabloid-sized Limited Collector’s Edition comics C46 (Justice League of America) and C47 (Superman Salutes the Bicentennial) – see Part Two – the Leftovers for more about these comics. Page 15: two half-page ads selling Isokinetics (an exercise technique – are they implying that readers of comic books are out of shape? Well, we ARE, but I resent the implication…) and another ad for the social security decorative plates/holders from page 6. Page 16: a full-page ad for NCG Merchandise’s comic book binders. Page 22: a half-page ad for New American Physique and a half page of 10 S. Schwarz & Company ads of various sizes: learn vehicle decor customizing, hobby coin company sales, Universal Inc. muscle growing technique, custom bicentennial t-shirts for sale, Jack Hunt (comic book back issues), the famous X-Ray Specs, Estell (comic book back issues), Abracadabra Magic Tricks, Debt Relief solutions, and Discount Comics (comic book back issues). Page 23: a full page public service ad for Justice For All Includes Children. This is #5 of the series. Superman instructs children on their rights and duties as citizens. Here he advises the kids not to crash a party. Trespassing is illegal and could be dangerous! Page 27: a full-page ad for “DC Salutes the Bicentennial” reproduced in Part One of this series. Page 28: 14 ads from S. Schwarz & Company of varying sizes: “Space 1999” models for sale, learn karate, Robert Bill (comic book back issues), Richard Alt (comic book back issues), Pacific Comics (comic book back issues), weight lifting techniques, stamps for sale, Howard Rogofsky (comic book back issues), muscle building techniques, baseball card holders (called “lockers” – now we would call them deck holders), CCCBA (comic book back issues), techniques to grow taller, live seahorses for sale, and then several small ads designed as “classified newspaper” ads for: earning money stuffing envelopes, selling t-shirt iron-on decals, secret agent pens for sale, gliders for sale, earn money addressing and mailing envelopes. Page 32: a full-page ad for muscle building (from the same company as one of the smaller ads on page 28). 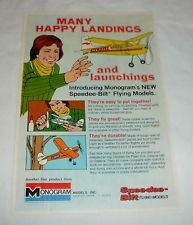 Inside front cover: a full-page ad for Monogram flying airplanes. “DC Salutes the Bicentennial”. Does that ring a bell? July 4, 1776 is the most important date in our country’s mythos. Most people born before 1970 remember events on and around July 4, 1976 – the Bicentennial! I was 11 years old on July 4, 1976 – turning 12 that November. On the day itself we were out of town at a funeral, but I remember seeing plenty of fireworks in the distance as we drove through the night. CBS television had a “Bicentennial Minute” every evening through the first part of the year – a notable star or politician described what happened 200 years ago that day. President Gerald Ford had the honor of describing the monotonous – er – momentous events of July 4, 1776: our founding fathers voted approval of our Declaration of Independence (it wasn’t signed until several weeks later). By then I was already firmly entrenched in my nerdiness – I watched “Star Trek” and read the novelizations, my favorite TV shows were science-fiction-y and usually of the Saturday Morning variety. By this time next year “Star Wars” would dominate my culture. Can you imagine a world before Star Wars? Hardly seems possible, doesn’t it? Within two years my brother will join the Air Force and give me his record collection – including several albums by a British mop-topped quartet. This would start a love affair that has yet to diminish. Not just “With the Beatles” (heh-heh), but with rock music, too. In later years I discovered my beloved Badfinger and the Moody Blues. But in the first part of 1976 my loves were foremost comic books and related merchandise – superhero action figures, albums, etc. I lived near Sparta, Illinois, home of World Color Press. They printed DC, Harvey & Archie comics. So those were the comics my friends and I read – usually given to us free by World’s employees. 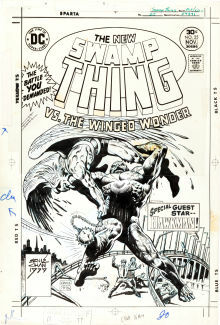 Marvel was foreign to us – although World Color printed Marvel, they weren’t in the free bundles given out to employees. My dad, by the way, did not word at World Color, but he did carpool with a lady whose husband worked there. “You have kids? Here!” Every few months we were in heaven when dad brought home a bundle of funny books. Marvel comics were available in supermarkets, though, but why buy comics when we can get them for free? Otherwise those characters were known only through their TV cartoons. By that I mean Spider-Man and the Fantastic Four. I was in my teens before I even knew who Iron Man or Thor was. I was in college before I knew what an X-Man was – hard to believe that, too, nowadays, isn’t it? So when I say I read comics as a kid – I mean DC comics. Archies went to my sister and Harvey (Casper and company) went to my youngest sister. A good division. “DC Salutes the Bicentennial with a Great Free Offer! Look for our July and Aug(ust) covers which have the RED, WHITE and BLUE headings and are identified by a right-corner number 1 through 33. “Example: … Cut and Send Top of Magazine! A comic book with the cover date of July 1945 may have been released and on sale in April or May of 1945. This would “trick” the salesmen into keeping the comic on the shelf longer. “Eh? This-a Superman comic says July, ees-a only June-ah. I beddah not troh it away-ah.” It didn’t work – newsstand owners weren’t stupid – but the tradition sticks to this day. 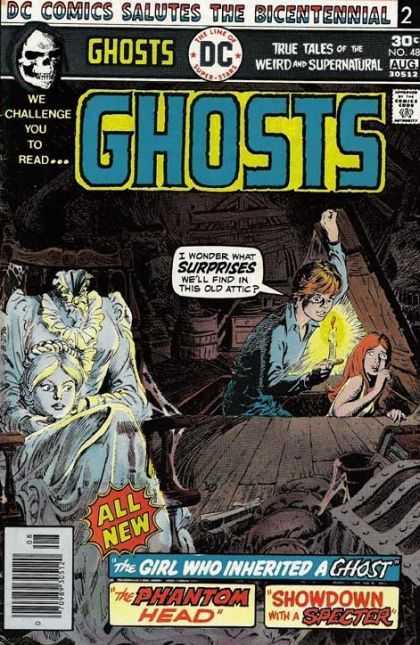 So the comics listed were on the stands and selling in April or May of 1976. 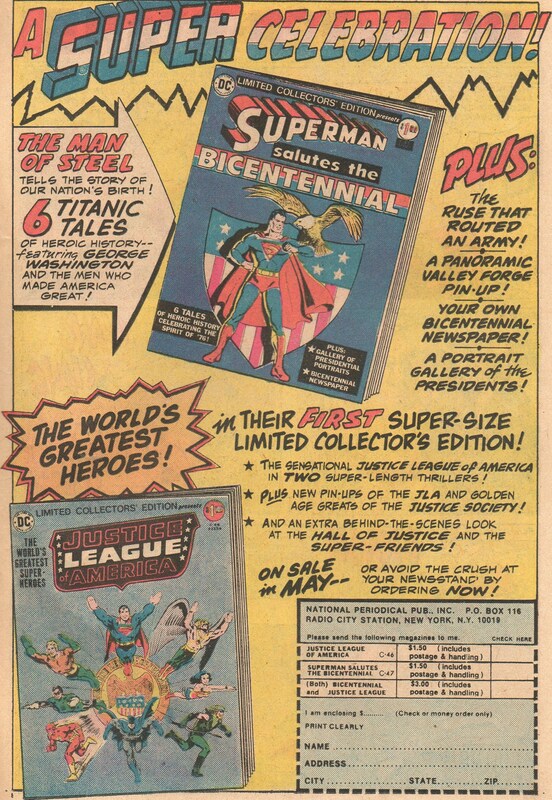 These ads first appeared in the June issues – I checked three comics I had full runs of at that time – World’s Finest, Brave & Bold and Justice League of America. 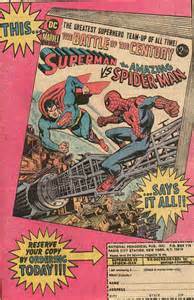 I checked the May issues and earlier and they had no ads for the Bicentennial; they each had ads for the Superman vs Spider-Man Tabloid-sized comic book out that year, however. This is nothing new. Kids have been collecting wrappers and box tops as long as there have been wrappers and box tops. This is not even a new thing in comics – ever since the first comics appeared in the 1930s kids were encouraged to cut out an ad or a symbol and cash in! But on this scale the only thing that I can think of as equivalent are the Marvel Value Stamps. In the letter pages of various Marvel comics were “stamps” of their characters on their letter pages. The stamps were only an two or three-inches-square and printed on the page as if it were any ad or text. Collect all 100 , purchase the handy-dandy Stamp book, paste the stamps on the inside and collect valuable prizes. The prizes consisted of discounts at various upper east coast conventions, free knick-knacks at said conventions, etc. A boy stuck in rural southern Illinois (a redundant term) didn’t find much use for such stamps. 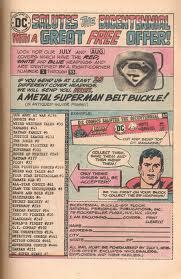 But a Superman belt buckle!? A Superman BELT BUCKLE!? Even at eleven years old … meh. It’s true – the prize didn’t thrill me. And twenty-five headings at thirty cents a comic (at the cheapest – some, like DC Super Stars #5 were fifty cents) was $7.50: a princely sum for a pre-teen. But forty years later it is another story. Collecting comics is now a fun hobby. They still entertain me – more so than modern comics. I want to read and review all 33 comics on the list. Maybe I’ll send in the tops (and ruin their value, true) and ask for my belt buckle. Oh sure the event ended on July 4th, 1976, but they might still have a few buckles lying around. Maybe DC will run across a box of them when as they pack for their move to LA. Writer Tony Isabella inspired me to do this series of reviews. For many years his blog contained reviews of comics released on the day of his birth. He now blogs about the comics released at the same time Fantastic Four Annual #1 was published – the comic that inspired him to want to be in the business. It was a day that changed his life. I considered doing comics released on the day of my birth, but nixed it. I don’t have that many and am not that interested in doing that much research. But DC’s Bicentennial issues – comics I have or can get for the price of a current comic? Why not? In past blogs I’ve reviewed the Adventure Line series of comics DC released in 1975 https://michaelgcurry.com/2015/01/02/the-dc-comics-adventure-line/, and released a companion/review of The Brave and the Bold comic as an ebook https://www.smashwords.com/books/view/497750. So I’ve had plenty of experience writing about and reviewing my favorite comics! So I decided to review the 33 comics with the Bicentennial headings in order of their number – regardless of issue number or release date. I will discuss the plot, art and creators of the particular issue and discuss the comic series itself. I will list the contributors of the letter columns and, if interesting enough, may sum up what they wrote. I will load each review with enough details to bore even the most ardent comic book fan. Will you join me on this trip back to July 1976? That’s the Spirit!